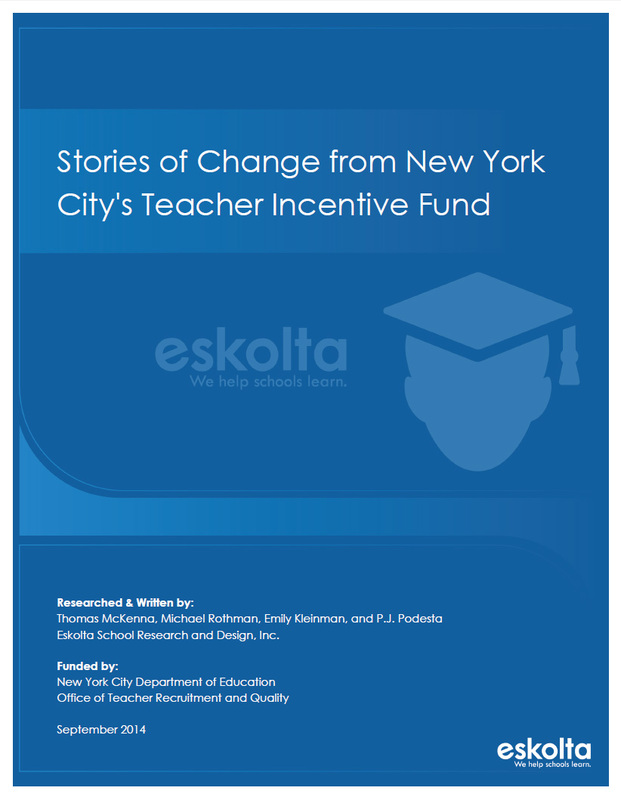 “Stories of Change” is a series of case narratives developed by Eskolta for the NYC Department of Education’s Office of Teacher Recruitment and Quality. The report provides five distinct stories of professional growth experienced by both teacher-leaders involved in the Teacher Incentive Fund (TIF) Program and the colleagues they coached. The examples in the report are drawn from interviews conducted at six middle schools participating in the TIF Program in the latter half of the 2013–14 school year. The narratives detail key elements of the program that shaped and improved teacher practice, including approaches to intervisitations, data inquiry protocols, and principles of instructional coaching. One case, for instance, examines the ways a committed teacher-leader was able to reach a jaded and resistant teacher with 25 years of experience and help her reexamine her instructional habits through reflection and collaboration.